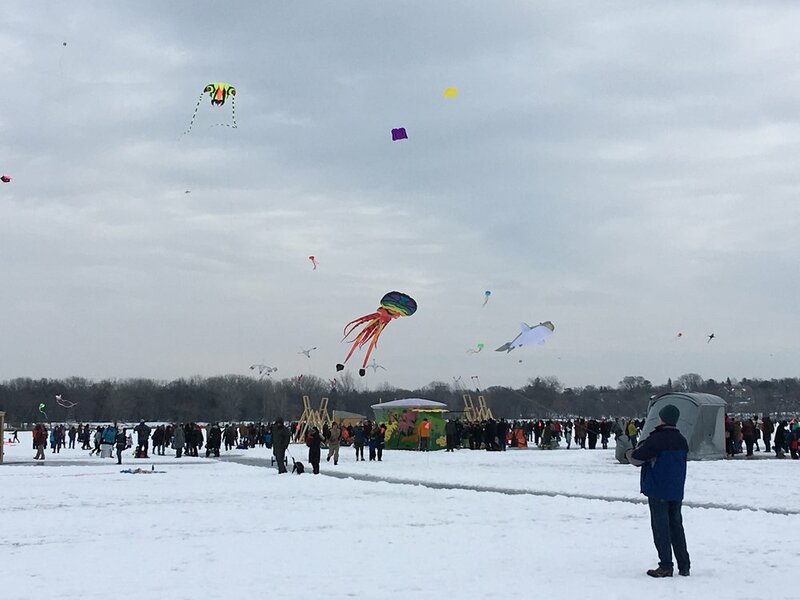 Walking across the lake yesterday you could see dozens of kites, ranging in size from a small children's kite to a giant flying shark. Below the kites were over a dozen small huts. The colorful and creative art shanty's were put up last weekend and will remain a few more weeks. The organization sponsoring the annual event says they "transforms a frozen lake surface into a creative community space that is part art gallery, part art residency and part social experiment." These engaging shanty's were playful and fun, drawing in attendees to help knit scarves attached to one shanty or race little ducks down from the second level of another. The atmosphere was lively with people milling about, entering the shanty's, flying kites, and even playing a game of "mother may I." One of the characteristics of Minnesota and the Twin Cities in particular is the cities do not shut down during winter. Almost every city has some sort of winter festival encouraging people to gather outside for a few hours. The metro area has something nearly every weekend to reduce the cabin fever that tends to set in after a long winter. Back home in Nebraska we just waited out the cold, which usually ends about 3 to 4 weeks ahead of Minnesota. A unique view of the Lake Harriet Pavilion from the lake instead of the shore. I have always wondered what the difference is between states and why some let the weather deter them while others embrace it. Is it cultural differences, city size, or length of seasons? If you are raised to go outside in the winter, that is likely what you will do when you grow up. If the cold weather lasts longer, you are less likely to settle for staying inside until it passes. It also helps if you are in a bigger city that has more activities to offer. In Rochester, they only have one major outdoor festival each winter. Regardless, it is more interesting living in a city that does not let weather determine what they do. Instead they embrace it and go fly a kite.